While my little family is recuperating from these nasty bugs we caught, how about another amazing recipe from Jill!? I am so thrilled to have her here sharing all of her secrets with us! Everything she makes is delicious. I’m so lucky to be her neighbor and friend! To see more of her amazing recipes, check out the ‘Recipe’ tab at the top of the page. 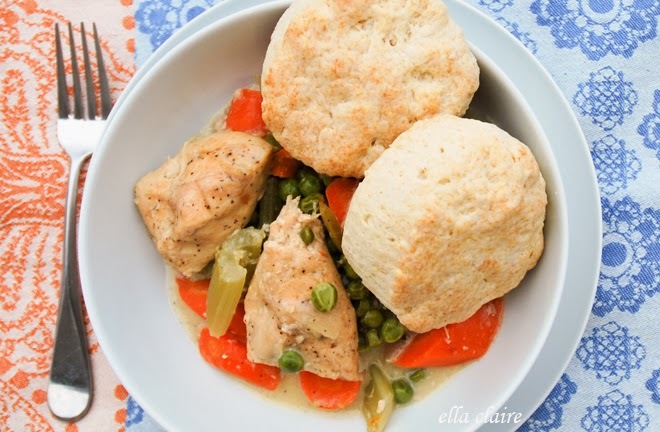 I love comfort food and easy crock-pot cooking and I feel like this recipe is just that. You can throw all the ingredients in to your crock-pot and then forget about it for the rest of the day. 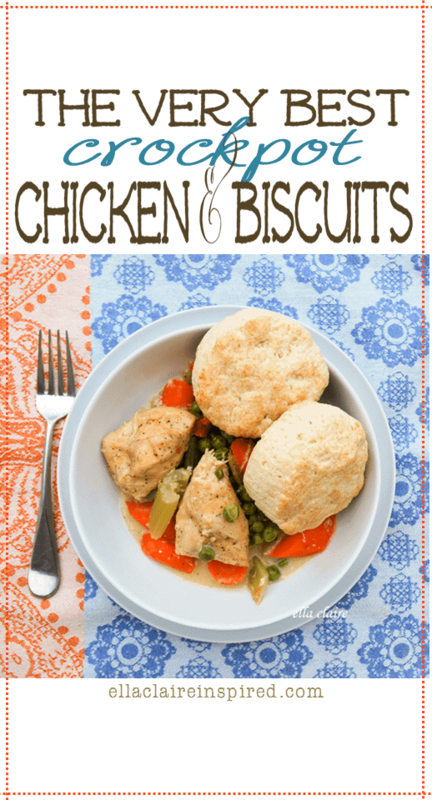 Also, If you don’t have any extra time, you can just use store bought biscuits to make this meal even easier. However, I highly recommend making these biscuits! While living in NYC one of my favorite breakfast spots was at Clinton St. Baking Co.. Everything on their menu is amazing and so I had to buy their cookbook. Their biscuits, muffins, pancakes, grits…..all delicious! I definitely recommend it! Or better yet, stop by Clinton St. the next time you visit NYC. Thank me later. In a slow cooker, toss together the carrots, celery, onion, and flour. Place the chicken on top and season with the poultry seasoning, 1 teaspoon salt, and 1/2 teaspoon pepper. Add the broth. Cover and cook until the chicken and vegetables are tender, on low for 5 to 6 hours or on high for 2 1⁄2 to 3 hours. Start biscuits about 45 minutes before serving. Or prepare the Easy Drop Biscuits (if using). 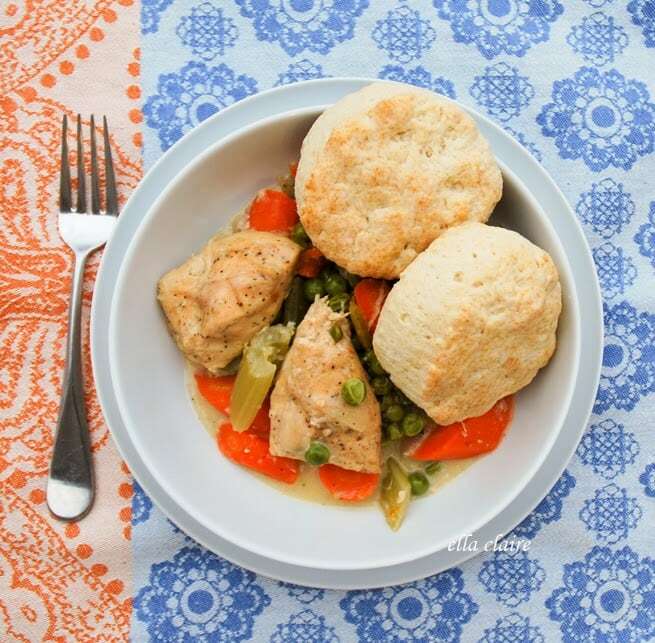 Ten minutes before serving, add the peas, cream, and ½ teaspoon salt to the chicken and stir to combine. Cover and cook until heated through, 5 to 10 minutes more. To serve, place the bottom halves of the biscuits in shallow bowls, then top with the chicken mixture and the remaining biscuit halves. Place flour and other dry ingredients in the bowl of an electric mixer. Mix on low speed with paddle attachment until combined. Add butter and shortening to the bowl and mix on low until the dough reaches a crumbly pea sized texture. Turn off the mixer and add the buttermilk to the bowl all at once. Mix very briefly on low until the dough just comes together. You do not want to over mix the dough. Turn the dough onto a floured surface and form it into a ball. Lightly knead dough two or three times until combined. Pat out the dough to a 3/4-1in. thickness. Shape the dough into a rectangle, making the sides high. Using a 2in. round biscuit cutter (I have used a plastic cup), cut out 4 biscuits. place on parchment lined baking sheet. Gather the dough scraps and form the remaining dough into another rectangle with high sides and cut out 2-4 more biscuits. Depending on how much dough you have left. Bake for 15-17 min. or until the biscuits are golden brown and cooked through. Halfway through baking, rotate the pan for even browning.